For more than 20 years, Qing Hu, a distinguished professor of electrical engineering and computer science at MIT, and his group have been working on sources of terahertz radiation that can be etched onto microchips. In the latest issue of Nature Photonics, members of Hu's group and colleagues at Sandia National Laboratories and the University of Toronto describe a novel design that boosts the power output of chip-mounted terahertz lasers by 80 percent. As the best-performing chip-mounted terahertz source yet reported, the researchers' device has been selected by NASA to provide terahertz emission for its Galactic/Extragalactic ULDB Spectroscopic Terahertz Observatory (GUSTO) mission. The mission is intended to determine the composition of the interstellar medium, or the matter that fills the space between stars, and it's using terahertz rays because they're uniquely well-suited to spectroscopic measurement of oxygen concentrations. Because the mission will deploy instrument-laden balloons to the Earth's upper atmosphere, the terahertz emitter needs to be lightweight. The researchers' design is a new variation on a device called a quantum cascade laser with distributed feedback. "We started with this because it was the best out there," says Ali Khalatpour, a graduate student in electrical engineering and computer science and first author on the paper. "It has the optimum performance for terahertz." As Khalatpour explains, the researchers' design is not tied to any particular "gain medium," or combination of materials in the body of the laser. "If we come up with a better gain medium, we can double its output power, too," Khalatpour says. "We increased power without designing a new active medium, which is pretty hard. Usually, even a 10 percent increase requires a lot of work in every aspect of the design." In fact, bidirectional emission, or emission of light in opposed directions, is a common feature of many laser designs. With conventional lasers, however, it's easily remedied by putting a mirror over one end of the laser. 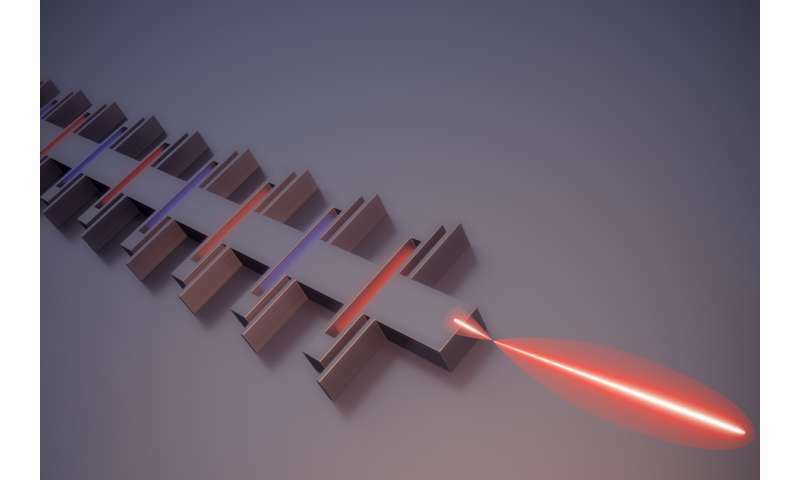 But the wavelength of terahertz radiation is so long, and the researchers' new lasers—known as photonic wire lasers—are so small, that much of the electromagnetic wave traveling the laser's length actually lies outside the laser's body. A mirror at one end of the laser would reflect back a tiny fraction of the wave's total energy. Khalatpour and his colleagues' solution to this problem exploits a peculiarity of the tiny laser's design. A quantum cascade laser consists of a long rectangular ridge called a waveguide. In the waveguide, materials are arranged so that the application of an electric field induces an electromagnetic wave along the length of the waveguide. This wave, however, is what's called a "standing wave." If an electromagnetic wave can be thought of as a regular up-and-down squiggle, then the wave reflects back and forth in the waveguide in such a way that the crests and troughs of the reflections perfectly coincide with those of the waves moving in the opposite direction. A standing wave is essentially inert and will not radiate out of the waveguide. So Hu's group cuts regularly spaced slits into the waveguide, which allow terahertz rays to radiate out. "Imagine that you have a pipe, and you make a hole, and the water gets out," Khalatpour says. The slits are spaced so that the waves they emit reinforce each other—their crests coincide—only along the axis of the waveguide. At more oblique angles from the waveguide, they cancel each other out. In the new work, Khalatpour and his coauthors—Hu, John Reno of Sandia, and Nazir Kherani, a professor of materials science at the University of Toronto—simply put reflectors behind each of the holes in the waveguide, a step that can be seamlessly incorporated into the manufacturing process that produces the waveguide itself. The reflectors are wider than the waveguide, and they're spaced so that the radiation they reflect will reinforce the terahertz wave in one direction but cancel it out in the other. Some of the terahertz wave that lies outside the waveguide still makes it around the reflectors, but 80 percent of the energy that would have exited the waveguide in the wrong direction is now redirected the other way.